The Attorney is a film about a particular time in history. The ‘Spring of Seoul,’ which followed the death of president PARK Jung-hee, was short-lived as CHUN Doo-hwan and his new military regime, under the pretext of re-enforcing the ruling power, destroyed the nation’s passionate desire for democracy. The Attorney reconstructs the ‘Hakrim Case’ which occurred in Busan during the most dark and cruel period in modern Korean history. University student gatherings where books were read and discussions took place in hopes of making a better world were branded as pro-communist groups intending to overthrow the status quo, and students who lost their battle due to harrowing torture began to give false confessions. Unlike the recent trend of packaging the 80s and 90s with romanticized nostalgia, The Attorney focuses more on ‘educating history’ rather than working on cinematic details such as artwork and cinematography. The situations within the narrative represent how power oppresses those resisting unjust national ideology as well as point out the problems of similar political cases that occurred for decades even up until this day. In other words, the film’s foremost claim is that tragedy will repeat itself if we do not learn from history. The Attorney is a film about a particular individual. With only a high school diploma, legal attorney SONG Woo-suk is somewhat of an outcast in a society ruled by school networks. Determined to become economically affluent, he manages to fulfill this goal by accepting cases which colleagues dare not take. That is until he accidently comes across a case in which a student activist’s human rights are abused and opens his eyes towards reality. 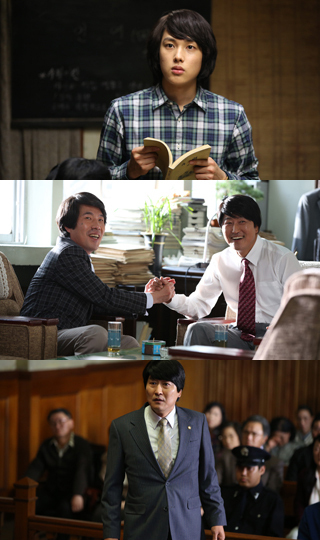 The Attorney is based on the true story of a man who became the president of Korea and the film ends its story right before SONG Woo-suk (who is based on a real character) actually jumps into the political scene. Instead of highlighting this politically dynamic period, the film clearly reflects the director’s desire to present a man who is greatly missed by the people. At a time when the process of verifying the qualifications of a politician inevitably reveals power-related corruption or excessive accumulation of wealth, The Attorney makes one yearn for a lost utopia when a man from a humble laborer’s background could stand with the people to fight against power. The Attorney is a film about a certain individual colliding against a particular time in history. The film opens with a subtitle stating that the film as ‘a fictional story based on real facts and characters.’ Considering that this real individual is still undergoing public scrutiny and that it will be hard to ignore those denying his significance, it isn’t difficult to anticipate the controversy that The Attorney will raise. Furthermore, from the viewpoint of reaching for the truth, a few misleading facts as well as the idealization of what was intended as a depiction of an ideal character doesn’t suit the film’s theme. The important question is whether this film can refrain from remaining as a mere spark that temporarily recalls the past or if it can trigger a real assessment and discourse on this particular era. This is the very reason why a balanced perspective cannot be lost as it stands between the conflicting positions of heated support and shameless criticism.